Like Miss America being require to participate in a number of public events where she is forced to put on a fake smile, it seems the winner of Mountain Dew’s DEWmocracy is required to be turned into a Slurpee. It happened with Mountain Dew Voltage when it won, and now it’s being done with the current DEWmocracy champion, Mountain Dew White Out. I’m sure it has the same “smooth citrus” flavor as a regular Mountain Dew White Out, but is it as xtreme? 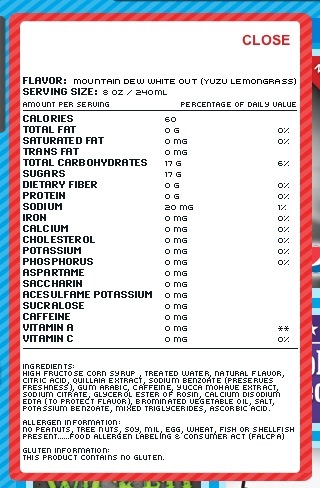 Well, according to the nutrition facts, it isn’t as xtreme because it contains zero milligrams of caffeine. However, according to the ingredients list, it is as xtreme because caffeine is listed in the middle of the list. I guess the only way to find out is to drink one while shooting enemies in the head playing Call of Duty and see if it feel comfortable. An 8-ounce serving has 60 calories, 0 grams of fat, 17 grams of carbohydrates, 17 grams of sugar, 0 grams of protein, 20 milligrams of sodium and, maybe, 0 milligrams of caffeine.